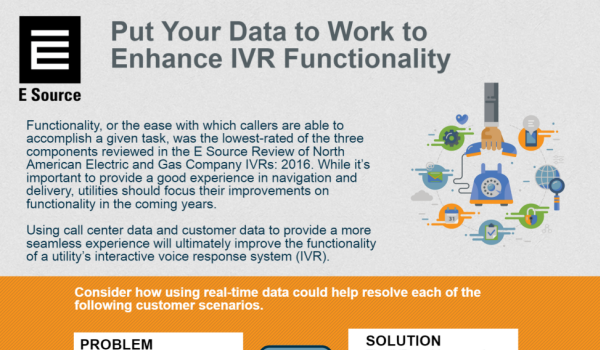 Since 2004, E Source has been benchmarking roughly 100 interactive voice response systems (IVRs) to gauge how successful they are in serving residential customers. We rate the availability and usability of utility IVRs based on key features that are of the most importance to residential customers. Our study has become the industry standard for assessing IVR improvements as they relate to customers’ contact preferences. The E Source review uses actual residential customer IVR use and feedback. It includes the largest gas and electric companies in the US and Canada, plus a representative set of small and midsize utilities. We recruit people from our local community in Colorado who are actual residential utility customers to conduct thorough assessments of the IVRs’ availability and usability. We hire people with a mix of genders and ages to conduct the reviews. To ensure that we get a good overall sense of how customer-friendly an IVR is, multiple residential reviewers call into each IVR and we perform quality-assurance checks. However, each feature is evaluated by a single designated reviewer. The overall benchmark score for each IVR is weighted equally on the user experience and the availability of IVR features. The user experience of a given feature is judged based on reviewers’ best-practice experiences with all types of company IVRs, not just utility systems. The features are selected because of their importance to residential customers. We also considered input from industry leaders on which features are important to utilities and which are most used by their customers. If you’re a subscriber, these links will take you to the study deliverables. If you’re not currently a subscriber, you may contact us for information on membership to pertinent E Source services.